WEYMOUTH — In many industries, loyal employees who put in years of exemplary service are often rewarded with something solid — like a gold watch. 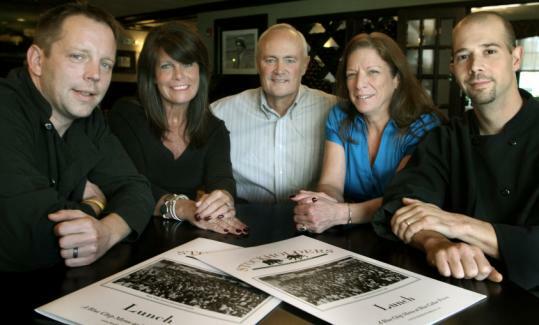 But a Weymouth restaurateur has taken his appreciation to a different level by awarding four longtime, trusted employees with nearly a half share in his new restaurant, no strings attached. And in that context, Stockholders, the name of Kevin Hynes’s new Wall Street-themed steak and seafood restaurant, takes on a dual twist. Along with its trading décor that reflects the variable world of stocks and bonds, the restaurant on Route 18 bears the message that good deeds and faithful service are noticed, appreciated, and, at least in this case, rewarded. Hynes said he is asking for nothing in return from the talented quartet other than continued passion and enthusiasm for providing a perfect dining experience to everyone who comes in the door each day. Hynes’s announcement just about blew away the new co-owners, who work with Hynes at his Inn at Bay Pointe, at the Quincy Marina. They are chef Richard McInerney, 38, of Weymouth; two general managers: Jeannie Russell, 49, of Bridgewater, and Karen Newhall, 50, of East Bridgewater; and sous chef Scott Boragine, 31, of Plymouth. Each will earn a salary, and then all will split 48 percent of the profits at Stockholders. Menu items are described as “blue chip food at blue collar prices,’’ from beef tips and Sicilian chicken parmesan, both at $15, to a bone-in 12-ounce filet mignon at $27. “This is just not something you find in this business,’’ said Boragine, who kicked off his restaurant career at 14 as a fry cook station helper in Halifax. He is now second in charge at the Inn’s kitchen. McInerney said he wants to use the opportunity to learn the industry’s business end so that one day he might open a place of his own. He said he and Hynes both believe that dedicated restaurateurs who could never afford to own their own places are the ones who most need the leg up, and having a partial share of Stockholders will give McInerney that chance. Russell has played the most active role in helping to get Stockholders up and rolling, as she did at Hynes’s former ventures, Dillinger’s in Plymouth and the Inn in Quincy. “I think it’s very thoughtful of him, and I’m very appreciative,’’ she said of getting her share of Stockholders. The four each get 12 percent of the business. In its first month, Hynes said, the restaurant did well, “far exceeding my expectations.’’ He declined to elaborate. Stockholders, at 6,000 square feet, has five dining areas: the Bull and Bears Bar, which is set apart by two 6-foot-high fish tanks; the Trading Pit Lounge; the Boardroom, reserved for functions with up to 50 guests; and two dining rooms, the Blue Chip Room and the Ponzi Room. Hynes’s son, Erik, is also key to the new operation, managing things out front with customers. So, are there too many cooks in the kitchen, perhaps? Kevin Hynes was a Weymouth police officer decades ago when he decided to follow his dream and open a restaurant. Eight eateries later, Stockholders is the first he’s opened in his old hometown, where he said he is looking forward to being a success. “There is a wait every night,’’ he said.